On Thursday, the much-delayed and much needed winter overnight finally fell into place. It’s been a rocky couple of weeks (pun intended) in the real world and as always, when things get tough, nature comes to my rescue. I was planning to do this the previous week. Some thought also went into doing it this coming week on my birthday, but that’s going to be a day hike with a more luxurious overnight to celebrate the occasion. Besides, the temperatures at night maybe something I will brave and did on this occasion, but are not enjoyable for most. 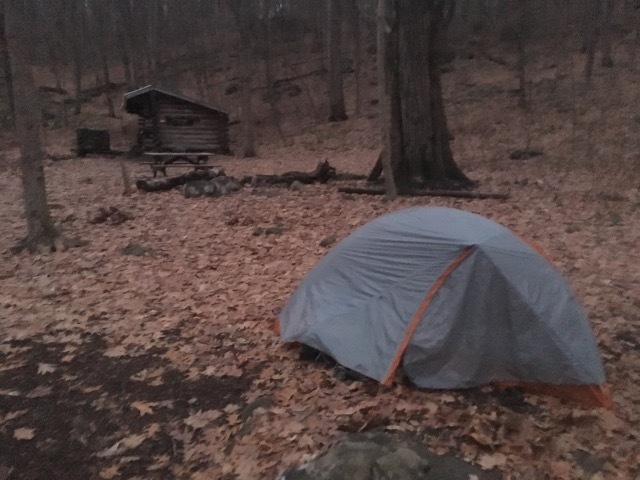 Fielden and I have had our share of cold nights on the trail, but 25 is pushing it for her and this is now only my second time camping on such a cold night. I had been going back and forth on whether I was going to do it, but a trip to Bass Pro shops/Outdoor world that morning provided the final inspiration. Their new location in Bridgeport, CT is amazing. I like knowing I can do it, so that if I do end up in these temperatures on a long section in the future, I am prepared. 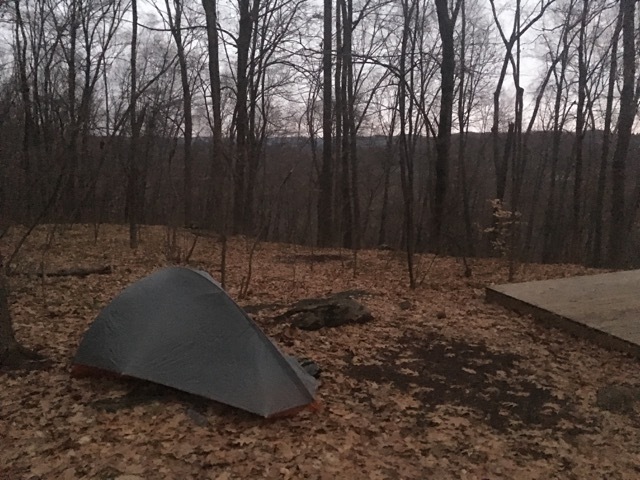 The last time was a very cold April night last year when I camped along the Housatonic River at Ten Mile River Campground. I also like doing these once in a while because it gives me a chance to re-test and possibly improve my layering and sleep system for the colder temps. I love testing gear. Like last time, the temperatures were around 25 degrees at the lowest. 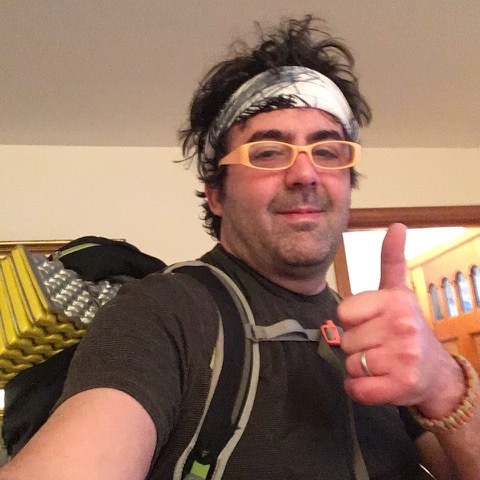 I decided to go up to Wiley Shelter on the New York Appalachian Trail. As I’ve been there 3 times now, I know the layout, so finding my way around in the dark would be easy. And its a short hike out and its close to a road in case it was just too cold and I needed an emergency bailout . But I did not. Clothing tops: (the bottom two were my hiking layers) Smartwool short sleeve base layer, Patagonia Dual Aspect hoodie (one of my favorite new pieces of gear, will also use for skiing and snowboarding), Marmot Precip rain coat. 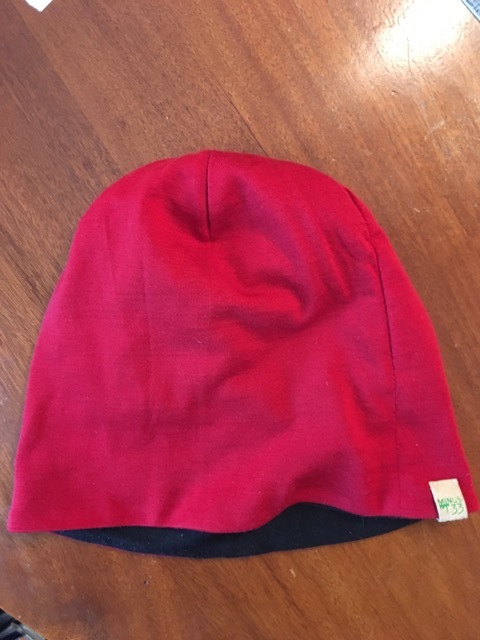 Hat: Minus 33 beanie – finally I found one that fits my big noggin! The final piece, the raincoat, was one I discovered and employed last time, because I just wasn’t at the comfort level I needed to be. Down is great but I didn’t want to sleep in my down jacket last time because once you do heat up it will wet out from sweat, and then become dangerous. I also don’t hike in down for the same reason, as I discovered on a day hike up Mt. Higby about a year ago. Sleeping Pads: I combined two pads like I did last time. Was only planning on using the foam one but brought my inflatable because I thought that might be too close to the ground and conduct too much cold and I was right. the Thermarest z-lite foam pad does help add R-Value and protect from roots and rocks underneath, but on its own I quickly realized I needed to be further off the ground to be properly warm so I blew up my Thermarest Neo-Air Xlite, and voila, I didn’t feel the cold ground. The foam pad is a bit long for my modest height of 5’7″ so I did what many thru hikers do and cut off the top two panels and will use those as a seat. This also makes it easier to carry the pad between the body and brain of my pack. Also one thing I’ve always read is to have a hot meal before bed as it will keep your body generating heat as it is working to digest the meal. So after a few failed attempts to get a lot of wet wood to light for a campfire ( a solitary mouse came by to watch and laugh at me failing before scurrying off), I got out my stove and had some Mountain House chili mac and washed it down with a little red wine. I did not bring a nalgene so I could not put a hot water bottle in my bag, but I didn’t end up needing it. I did put my Sawyer squeeze filter in there to keep it from freezing. I have frozen (or at least I think, don’t wanna find out the hard way) two Sawyer minis already because I left them in my backpack which I left in my car for a couple days after a winter day hike. They may be fine. But Guardia is no way to find out that its not. And at $25 each its really not a big deal to replace them. Anyway I like the squeeze because its only an ounce or two heavier and the filtering flow rate is much faster. Since I usually hike with Fielden and or the kids, and I’m often in a hurry (i.e. impatient) I prefer the faster rate. In the future I’m going to get a Katahdin hiker pro, as my friend Ray recommended it to me and showed me his after the hike. I thought they were much bulkier and heavier but really they’re not. And being able to pump the water from low sources is a seriously good feature. I always bring back up tablets in case any of these filters fail or I meet hikers who have no method of filtration. This filter is more in the $60+ range so I will wait till the next sale at REI. When I hiked in, temperatures were still in the mid 30s. The lowest point of 25 was around 3 or 4 am and returned to the 30’s with sunrise. But this is the time when are bodies are really at their coldest so its important to have the right amount of insulation from the cold so we are not at risk of hypothermia. My layering system and meal planning really succeeded in keeping me very warm throughout the night. I also re-tested the whole smart water bottle with the Sawyer filter screwed on top. Thru hikers rave about this on their channels, as its so easy and convenient. My water bladder has sprung a tiny leak and so I figured I’d give it another shot. Still unimpressed. 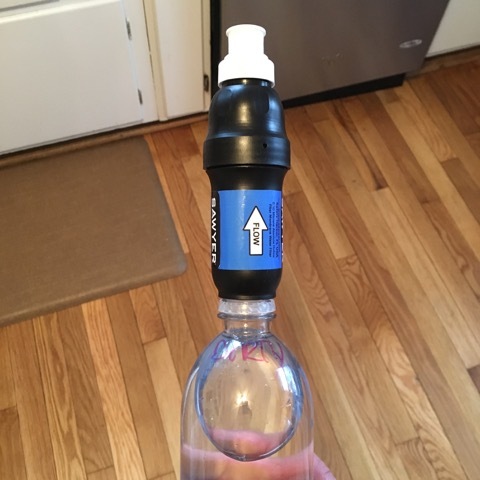 While it is convenient to just unscrew the thing, fill it with water and drink, every time you drink the suction compresses the bottle so you have to unscrew it partially to let air back in there. Secondly I don’t have a way to attach it to my pack straps and even then it would be awkward and bulky. So I had to put it back in my pack pocket which felt like dislocating my shoulder each time to reach back there. 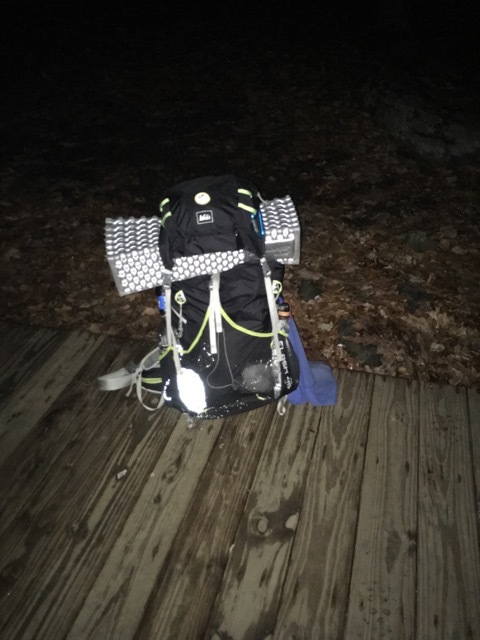 Since my pack has one large pocket, it also isn’t held in there securely and fell out once, which I worried about happening. If it did and there wasn’t a pump at the shelter (there is) I could be in real trouble. So I’m not doing that method again. Ill get a new bladder and that’s that. A few other gear notes: I bought a sea to summit x-cup for solo hikes so that I could have my coffee in it in the morning and not have to use my pot which I will be using for my meal. When I go with Fielden we have a cook pot with two cups… I did not end up using the x-cup though as my morning plans changed as you will see below. But I am looking forward to trying it. I was finally convinced on it when one of the hikers I watched, Homemade Wanderlust, mentioned how much she loved it. Also, I have owned several hiking and outdoor watches. A few seasons ago I experimented with the Suunto Ambit GPS watch. I had some fun with it but not being able to charge it without USB led to it shutting off in the middle of a hike when I needed it. So I traded it for a Casio Pro-Trek. No GPS on board, but it charged by solar, has a barometer, altimeter and compass. 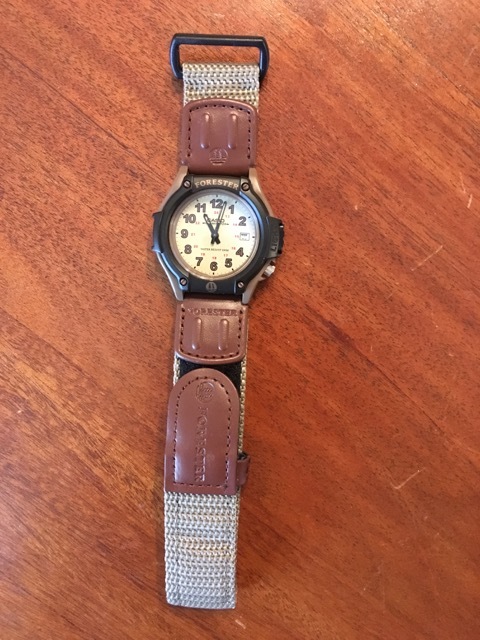 A cool watch and everything but I never used any of those features, and I had a little of trouble reading the tiny numbers and dials at night. As the battery has since died, I went to Wal-Mart and got a $20 Casio ‘Forester” watch. It has a face I can easily read (except the date window which is not crucial), a powerful backlight that is easy to turn on, and a fabric and velcro strap for durability and comfort. Honestly, this watch is all any of us need. I love this little watch and I don’t have to worry about banging it up or breaking it. If I do, I’m out $20 not $200 or $400 even. A no-brainer. All those gadgets are neat, and fun to try out, but most are overkill. If anyone is interested in buying my Pro-Trek, let me know. just needs a new battery. 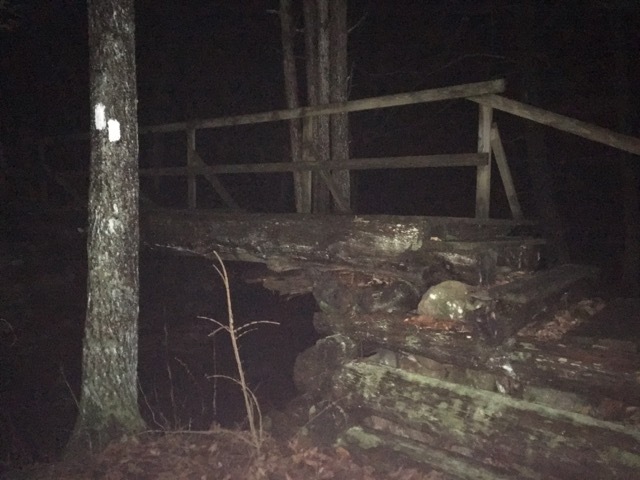 This was also my first experience night-hiking in earnest. I was a little surprised sunset was so early and sunrise so late, as its getting close to February. Sunset was slated for 4:58 and I knew sunrise has been around 7am lately. Lots of time alone in the dark! I was racing the sunset as I drove up. I guess you can park just north of the shelter on Duel Hollow road overnight but I wasn’t certain so I parked at Hoyt Road which meant a 1.2 mile hike in. There’s some decent little ups and downs here and as I walked in the sun was setting fast. 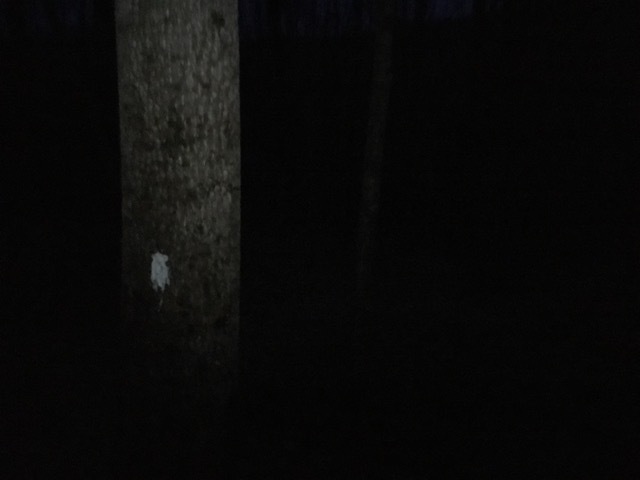 It was fully dark as I reached about a quarter mile in. 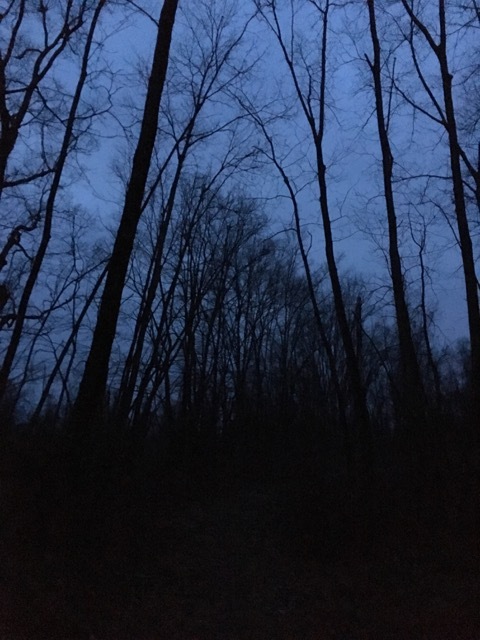 One owl swooped overhead as I followed the dark trail, and the howl of a coyote was heard in the distance. Definitely a good way to keep one’s senses active! There’s not a whole lot you can do if something out there has plans for you. Still i told myself I’d much rather go that way than dying suddenly at work or home from a stress-related heart attack! I’m 45, this is prime age for that so I have to take care of myself. Before I nodded off my friends and family checked in on me. 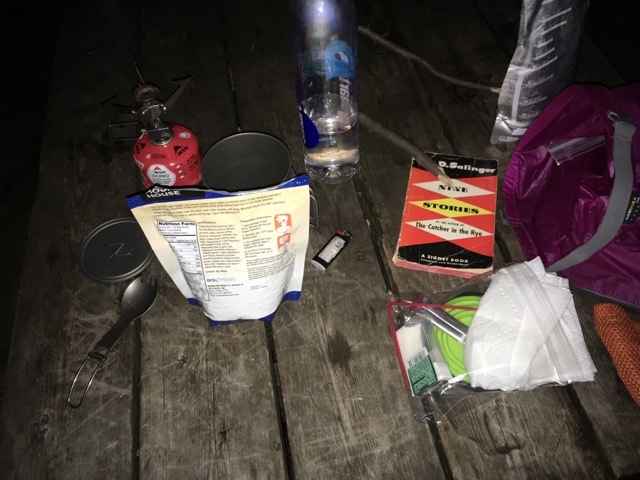 My friend Ray, another maintainer from the Connecticut AMC who lives 5 minutes away, offered to meet me at the campsite and bring breakfast! How could I say no to that. He also offered to be my emergency bailout pickup if I needed it. At 7am I let everyone know I was alive and didn’t freeze to death. In fact I was very warm! Sunrise wasn’t really impressive as it was overcast, so no red hot fire ball burning over the ridge line like last time I was there. Ray came around 7:45 with Dunkin Donuts coffee and and egg and cheese and we chatted for a while. He gave me a lift back to my car and then we went to his house for a bit so I could warm up by the pellet stove. I had a great time, faced some fears, braved the elements and learned a few things about myself and my skills. For my birthday, Fielden and I have decided to check out Minnewaska State Park and or the adjacent Mohonk Preserve as many of my friends have been posting video and photos from there and I want to do a hike in a new place and where we only have to bring one car.